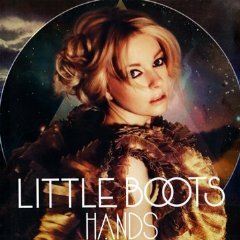 little boots, aka 24 year-old blackpool native victoria hesketh, is proud to release her debut album 'hands' on 679 / atlantic in the uk. 2008 was an eventful year for ms hesketh, to say the least. what started as a bit of fun (recording 'funtimes' covers in her pajamas) eventually led to homepage exposure on youtube, racking up more than 250,000 views overnight and her artist profile being one of the most subscribed to in the uk. claiming little boots as her moniker (the latin name caligula translates as 'little boot'), victoria eventually released her limited edition 7" single 'meddle' to rapturous applause from every corner of the press. the white label moroder-inspired 'stuck on repeat' and various remixes started popping up everywhere, making her one of the 'most blogged about artists' according to aggregator hype machine. in november '08, jools holland's producer took a chance booking a virtual unknown for what would become one of the most intriguing performances of the year. the only female to perform on the night (alongside heavyweights al green, the killers and damon albarn), victoria wowed the audience with her effortless skill: singing, playing three instruments (piano, stylophone and her beloved tenori-on), throwing in handclaps for good measure. the year ended with little boots being picked as runner up for the brits critics' choice award, and 2009 began with her topping the bbc's sound of 2009 poll. phew!